The astronomer Hugh Ross has had a great impact on many churches and individuals in recent years. His organization, Reasons to Believe, coordinates his many speaking engagements and publishes a newsletter called Facts and Faith. He has written six popular level books on the Bible, science, and apologetics.1,2,3,4,5,6 The secret of Ross’s appeal is that he claims that modern science has confirmed many things about the origin and history of the world that the Bible had previously told us. This gives some believers spiritual encouragement and a great deal of intellectual satisfaction. Ross argues that science alone can drive men to the correct understanding of our origin and hence see the necessity of a Creator. But this assumes that fallible men using a man-made (and hence fallible) methodology (science—in particular origins science7) with an incorrect postulate (atheism) can come to the truth about God. It would be most unexpected and illogical for a system of thought to reach a conclusion that is in contradiction to one of the basic postulates of that system. This paradox underscores Ross’s greatest misconception of how modern science works vis-à -vis the question of origins. As Johnson has pointed out, modern science, even origins science, by its very nature starts with the assumption of materialism.8 This assumption excludes consideration of any metaphysical reality, and leads to such quotes as those of the late Carl Sagan, ‘The cosmos is all that is or ever was or ever will be.’9 This assumption is blatantly atheistic. That does not mean that all, or even most, scientists are atheists. It merely means that the total exclusion of any possibility of a Deity makes most of modern science an atheistic enterprise, at least tacitly. The truly important things about God that one must know can be found only in Scripture. Ross obviously knows these things from Scripture, and he attempts to imprint them onto general revelation. Scripture does not support this. Indeed, it appears contrary to clear teaching of Scripture—if Ross were right, there would be no need for missionary activity, contrary to Rom. 10:13 ff. In his zeal to make a strong case, Ross has grossly overstated this argument. At best, this is sloppy logic and exegesis, and his equation of general and special revelation is seriously flawed. Anyone even remotely familiar with John 3:16 is struck by the glaring omissions of this paraphrase. No mention is made of such important terms as ‘only begotten (Greek monogenes = unique, special)’ ‘Son’, ‘believe’, ‘not perish’, and ‘everlasting life’. This is either blasphemy to the point of heresy or gross carelessness of the first rank. Another major problem is that the ordering of the events of Genesis does not even agree with the pronouncements of modern science, with which day-age theorists are so eager to harmonize. To answer this difficulty, Ross appeals to overlapping days.19 For instance, the creation of plants was on the third day, before the creation of animals on days five and six. But the plants that are specifically mentioned as being created on day three are flowering plants, plants that according to most scientists appeared very recently. This would seem to place these plants during day six when creeping things were created. Ross explains this by claiming that it is the first appearance of plants that is important, hence their mention so early on day three. On the other hand, Ross claims that birds and fish are mentioned on day five, despite the fact that this makes no sense in terms of the usual order that modern science claims. Does Ross reject modern science on this? No, he argues that day five overlaps partly with days three and four, and probably six as well. It is interesting that the details of Ross’s teaching on this are not found in references 2—5. His latest book contains some details,20 but the greatest details are found in his audio tapes and pamphlets, which enjoy far less circulation and publicity than his books. 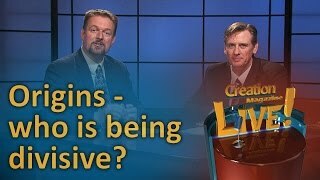 Ross repeatedly shuffles the events of creation to claim that those events that occurred on different days did not, while those events that occurred on the same day actually happened at different times. Under such contrived rules of interpretation the motif of a six-day creation, if you will, begins to collapse. What would have happened to the ancient Hebrews if they would have applied this reasoning to their week (Exodus 20:8—11)? They could have concluded that if they rested during some of the first six days of the week, then they could have worked on the Sabbath. After all, the Lord had overlapped his actions during the days of the creation week, so why could not they? It is obvious that such an attitude would have been an affront to the Lord of Creation. In like fashion, so is Ross’s ‘overlapping days’ notion. Equally frustrating is Ross’s claim that modern (uniformitarian) science has borne out the claims of the Bible about origins. Both of these practices amount to deceptive advertising. When one really examines his claims, it is obvious that Ross can only achieve the harmonization he desires by conducting surgery on the biblical account of creation. Unfortunately, most people in his intended audience never grasp what he has done. In retailing, this sort of practice is known as ‘bait and switch’. Ross makes much use of the principle of causality in conjunction with the big bang to argue for God’s existence. Causality means that any event that occurs (an effect) has some cause. Let A be a cause, and B be its effect. Then logically one can say that A causes B. All effects in turn become causes of new effects, and so forth. At any time there are countless chains of cause and effect that are parallel and intertwined with one another. Conversely every effect must have a cause. Logicians and philosophers have long recognized that in the distant past there may have been an ‘uncaused cause’. That is, there was a cause that was not the effect of an earlier cause, and from which all subsequent cause and effect relationships descended. There are philosophical debates on causality that cannot be covered here. ‘… I have been mystified by evangelicals’ apparently uncritical acquiescence to some of the positions advocated in this book [Ref. 4]. In discussing how finely balanced the expansion of the universe must be to permit the existence of life, Ross states that the expansion rate ‘…cannot differ by more than one part in 1055 from the actual rate.’ 35 Ross gives no reference for this figure, so one is left to guess where he got this nonsense. In the 1990s, there has been a major debate on the value of the Hubble constant, H0, which measures the expansion rate of the universe. For a while it appeared that we might not know H0 within a factor of two, though the situation appears to have improved a bit. Still, it would seem that if it were thought that the expansion rate could not vary by over one part in 1055 for life to exist, we would have to know the expansion rate with that precision. The value of H0 continues to be revised by amounts far larger than one in 1055. The stakes in the controversy over the value of H0 have been high, because an increased Hubble constant leads to a younger universe. For a while it appeared that globular star clusters were older than the universe. In The Creator and the Cosmos, Ross ignores the astronomers who have presented evidence of higher values of H0. Teams led by Wendy Freedman and Michael Pierce have given strong cases for this. Yet in discussing new measurements of H0, Ross does not mention these, but opts instead to rely solely upon his good friend Allan Sandage,36 who is one of the leading figures arguing for a lower value of H0. Such gross oversimplification and overstatement of his case is all too common with Ross. Another example is his handling of COBE (COsmic Background Explorer) data.37 Ross states that the observed inhomogeneities in the cosmic background radiation (CBR) found ‘… were just what astrophysicists thought they would find.’ The truth is that the COBE was designed to detect the temperature fluctuations that astrophysicists expected, but that the original COBE data showed a perfectly smooth distribution. It was not until some very high-powered statistical techniques were applied to the data that much lower than originally expected fluctuations were found. At that point, big bang models were recalculated to ‘predict’ the data. How this shows perfect harmony with theory and observation as Ross claims is a mystery. Ross also claimed that the Pacific Ocean basin is the scar left from when the moon was formed by separation from the earth. That is a very old idea that was discarded decades ago. Today, the Pacific Ocean basin is explained entirely by plate tectonics. These blunders and outdated ideas are inexcusable for a scientist. That is ironic, because Ross often dismisses his creationist critics for supposedly not having the credentials to adequately understand science. Both Davidheiser and Sparks show the sloppy manner in which Ross approaches science and facts in general. One illustration dealing with astronomy will demonstrate this. A few years ago, Hugh Ross and Duane Gish were guests on James Dobson’s popular radio program, Focus on the Family. During the discussion, the question of star formation came up. Gish questioned the possibility and observations of star formation today. In his response Ross, blithely stated that ‘…we see star formation in real time. You can take your pair of binoculars out tonight and watch it. It’s actually happening.’44 That is a blatantly false statement that no other astronomer would endorse. Perhaps what Ross meant to say was that with a pair of binoculars anyone could see regions in space where stars are thought to be forming now. Most astronomers today would consider that statement to be true. However, that is not what Ross said. He was either being very sloppy or incompetent. In either case his statement certainly misled many people. While Ross’s biggest blunders occur in public addresses, even his books contain some careless errors. For instance, his most recent book places the Scopes trial in 1927,45 not correctly in 1925. Subtler, but equally troubling examples, of bungling abound. For instance, Ross recently claimed that the current 71 to 29 percent ratio of water-to-land surface on the earth ‘… has been theoretically and observationally demonstrated to provide the maximum possible diversity and complexity of life.’46 No reference was given for this statement, so it is impossible to determine where Ross discovered this ‘fact’ or if indeed he incorrectly handled it as well. Given the many variables involved in determining such a thing, it is difficult to conceive that one could reach such a conclusion theoretically. But even more troubling is the assertion that this has been ‘observationally demonstrated’. Short of observing a large number of earth-like worlds with various water-to-land ratios and counting the flora and fauna on each, just how could such a thing be demonstrated observationally? In the same book Ross writes that ‘ … theory and observations both confirm that all planets start with opaque atmospheres.’47 Again, no references were given, but short of directly observing the birth and development of a large number of planets, how could this be observationally tested? To some these may seem like petty objections, but these sorts of misstatements are common in Ross’s works. Ross, H.N., The Genesis Question, Navpress, Colorado Springs, 1998. [See review by Jonathan Sarfati, from CEN Tech. J.13(2): 22–30, 1999 — Ed.] Return to text. The science of origins — unrepeated events (singularities) of the past — is contrasted with operation science — repeatable regularities in the present — in more detail in Normal, L., Geisler, N.L. and Anderson, J.K., Origin Science: A Proposal for the Creation-Evolution Controversy, Baker books, Grand Rapids, MI, 1987. Return to text. Ross, Ref. 1, pp. 181–182. Return to text. Kelly, D.F., Creation and Change: Genesis 1:1–2:4 in the light of changing scientific paradigms, Mentor (Christian Focus Publications), Ross-shire, UK, 1997; see review by Wieland, C., Journal of Creation12(2):152–154, 1998. Return to text. Ross, Ref. 6, pp. 38–53. Return to text. Van Bebber and Taylor, Ref. 10, pp. 84–91. Return to text. Sarfati, J.D., If God Created the Universe, then Who Created God? 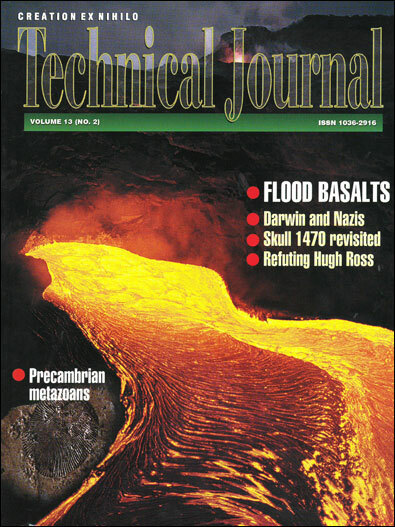 Journal of Creation12(1)20–22, 1998. Return to text. Faulkner D.R., Book review of Beyond the Cosmos, by Hugh Ross, CRSQ 34:242–243, 1988. Return to text. Craig, W.L., Hugh Ross’ extra-dimensional deity: a review article, J. Evang. Theol. Soc.42(2):293–304, 1999; quotes on pp. 193,304. Amazingly, Craig calls Ross ‘evangelicalism’s most important scientific apologist’, which, as shown here, is hardly flattering about Craig’s own scientific competence. Return to text. Ross, Ref. 3, pp. 116–117. Return to text. Faulkner D.R., Comets and the Age of the Solar System, CEN Tech. J.11(3):264–273, 1997. Return to text. Ross, Ref. 4, pp. 37–38. Return to text. Ross, Ref. 4, pp. 42–43. Return to text. Ross, Ref. 4, pp. 24–26. Return to text. Shigeru I., Canup, R.M. and Stewart, G.R., Lunar accretion from an impact-generated disk, Nature389(6649):353–357, 1997; comment by Lissauer, J.J., It’s not easy to make the moon, same issue, pp. 327–328. [See also The Moon: The light that rules the night — Ed.] Return to text. See Wieland, C., Goodbye, peppered moths: A classic evolutionary story unstuck , Creation21(3):56, 1999. Return to text. Text of the Focus on the Family radio broadcast on August 12, 1992. The transcript (apparently heavily edited by Focus on the Family to remove Dr Gish’s strongest points) may be found at: <http://www.talkorigins.org/faqs/gish-ross-debate.html> (on a pro-evolution and mainly atheistic website). Return to text. Stoner, D., A New Look at an Old Earth, Resolving the conflict between the Bible and science, Harvest House, Eugene, OR, 1997. See reviews of the 1992 edition by DeYoung, D., Creation Res. Soc. Quarterly31(2):94, 1994; Garner, P., Origins21:17–19, 1996—most of their criticisms apply equally well to the 1997 edition. Return to text.